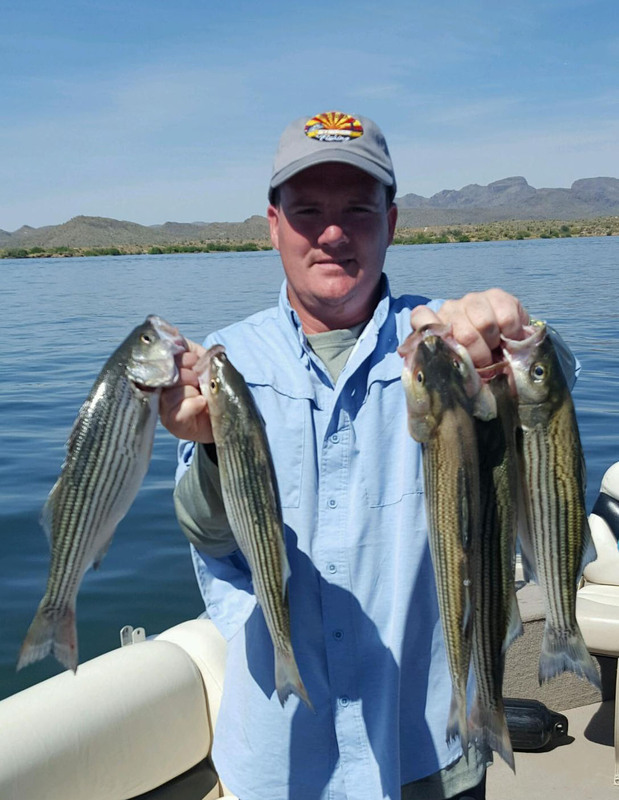 The crappie spawn continues on Roosevelt Lake, however, the water conditions have changed. With the sudden higher ambient temperatures, algae blooms are present in a lot of areas of the lake, especially in the shallow waters where crappie are spawning. 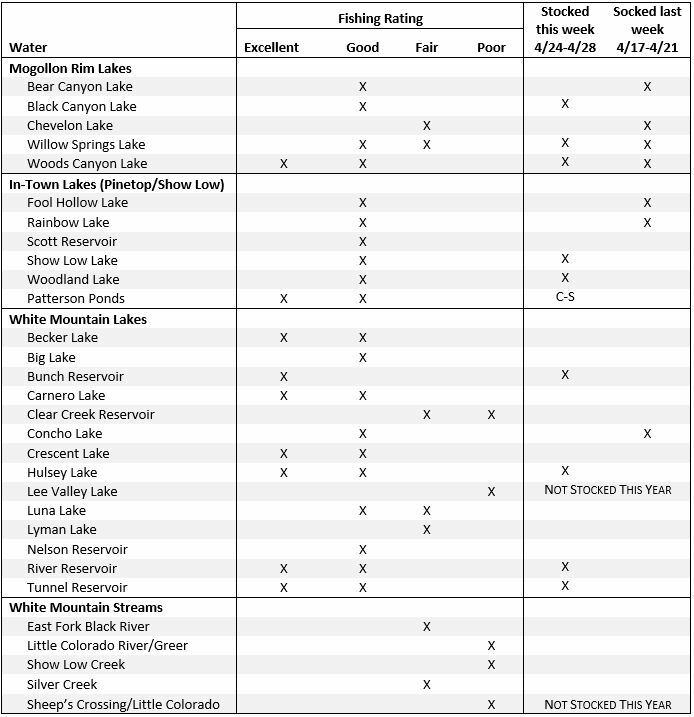 This is frustrating some crappie anglers, however if it enhances the success of the spawn, crappie anglers will be very happy in a year or two. Water temperature has been 67-70 degrees. Majority of bass are in post-spawn. The top-water bite had been poor last weekend, but with calm, warm weather this week, top-water action could pick up. Try fishing shallow early in the morning (2-5 feet) with crankbaits, spinnerbaits and chatterbaits and switching to dropshots and Texa rigs. Gary Senft, the Bass Pro at the Mesa Bass ProShops, said Texas-rigged baby brush hogs in watermelon red and watermelon gold, as well as morning dawn Roboworms, have been effective. “The bass bite is on! I love encouraging others to get outdoors. I caught these four bass off my kayak in a little over a week … drop-shotting plastics. Jim Goughnour of Rim Country Custom Rods reported Trout fishing in Rim Country streams is excellent. Nearly all Rim Country trout streams being stocked weekly near easy access parking and pull-off areas along the streams. Experienced fly anglers are recommending Christopher Creek, Canyon Creek, East Verde, Haigler and Tonto Creeks. Power-bait using a small trebled hook can almost guarantee a limit of trout. In 3 hours of fishing in difficult weather conditions, my fellow fisherman & I caught and released (1) 2-pound brown trout, (3) 12 to 14 inch rainbow trout, (1) 9-inch white crappie, and had (1) 3-pound brown trout and (1) 2-pound rainbow trout that we were unable to land, before the hook popped out of their mouths! All fish caught on 2-inch Crappie Minnow Tubes. Weather Conditions: Winds 18 to 21 mph, with gust as high as 31 mph Water Conditions: Muddy. Folks were catching fish PowerBait on Sunday when my coworker was there fishing. He was catching fish from his boat fishing flies. He was moving them really slowly. He caught a 13” browns trout and 10 Rainbow Trout. Most of the fish were over 13” but he did catch some fresh stockers. Stocked this week. Frances Short pond was stocked last week and will be stocked this week. Folks were catching fish on Garlic rainbow PowerBait when I was out checking the Pond on Monday afternoon. Folks were also catching fish on worms, and salmon eggs. I also talked to some folks who were catching fish on pistol petes, and white roostertails. Stocked last week, scheduled to be stocked this week. Lower Lake Mary has had about 22,000 larger (10 + inch) Rainbow Trout stocked in the last couple of weeks along with about 12,000 smaller (6-8 inch) rainbow trout. The stockings of rainbow trout contained some really nice trout with one being measured at about 18 inches. Fishing is starting to pick up a little bit with some fish being caught on PowerBait. I had a report from a fly angler who was catching some nice size trout on leach patterns. Stocked last week. The road is open. I’ve had some reports of folks catching rainbow trout, brown trout and channel catfish. Our walleye tagging trip was challenged by cool windy weather. The water in lower Good Hope Bay was murky but fishable. The visibility was about 3 feet which is fine for walleye but may inhibit bass and stripers from finding our baits. Bass catch was slow, with stripers uncommon as we used bottom bouncing techniques to target walleye that are abundant in the northern lake. Water temperature ranged from 57-62 during the day which proved to be a bit cool for these walleye. See the full May 1 report from Wayne Gustaveson (www.wayneswords.com). LAKE HAVASU – A 5-pound redear sunfish was just caught. Typically anglers can catch big redear with nightcrawlers on dropshot rigs. ROSE CANYON LAKE – Rose Canyon will be stocked 2 weeks before Memorial Day weekend with trout. 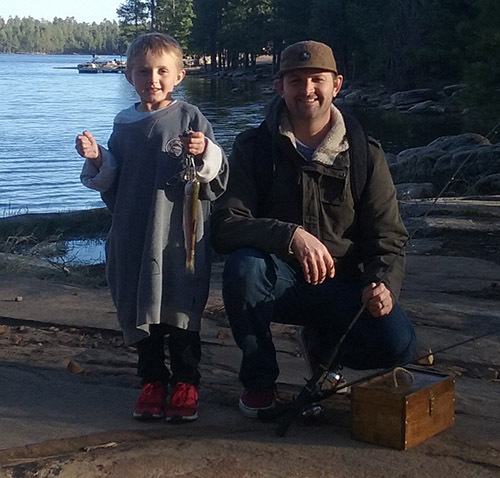 Andrew A. Fished sunrise to 11 a.m. before the lake closed due to the fire on Mt. Lemmon. Caught trout steadily the whole morning with trout-colored rooster tails. A friend and I took our limit. The lake is closed to vehicle access for the winter. Anglers can still access the lake by foot.